#117205 at N. Freedom, August 18, 2001. #117205 at North Freedom, April 2000. 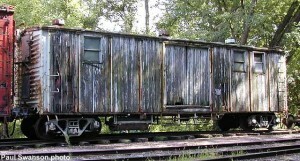 This unusual looking boxcar is actually of composite construction–it utilizes both wood and steel in its structure. The underframe, carbody ends, roof, and carbody sidewall framing are all of steel, while the side walls are of wood. The vertical positioning of the steel framing in the carbody gives the car a unique look, quite unlike the composite boxcars of the previous decade or later during WWII. #117205 was built for the Atchison Tokpeka & Santa Fe by American Car & Foundry in February of 1923. In 1954, the railroad renumbered it to #197048. 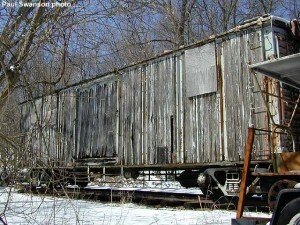 At some point in time, the car was converted to work service as evidenced by the makeshift windows in the walls, the water tank hung underneath the frame, the wide steel ladders placed under the boxcar doors, and the rooftop ventilators. Perhaps this occurred at the time of the 1954 renumbering. In 1982, the car was donated to Mid-Continent and moved to North Freedom. It is presently used to store electrical supplies for the museum.